"Excellence in service with creative presentation. 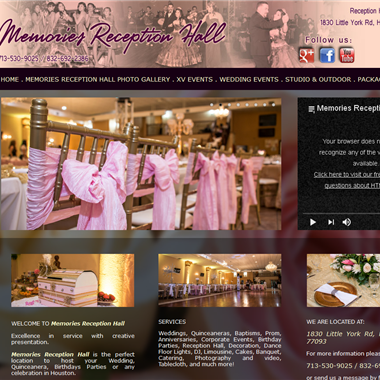 Memories Reception Hall is the perfect location to host your Wedding, Quinceanera, Birthdays Parties or any celebration in Houston. Memories Reception Hall has packages for all sizes and budgets and can custom design a package to make your celebration a memorable one. We make special events into a night to remember!" From commemorative co-branded House of Blues merchandise, customized gobo lights, interactive entertainment and creative decor options, House of Blues Houston’s versatility can perfectly complement your private event objectives. 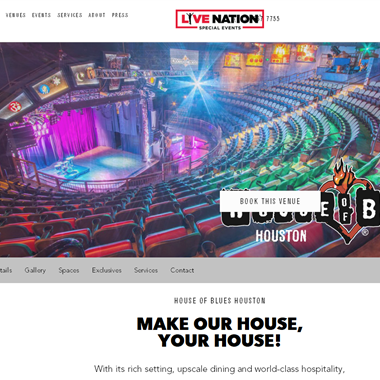 House of Blues and Live Nation bring knowledge, experience and event planning style, helping you create an everlasting special event to remember. 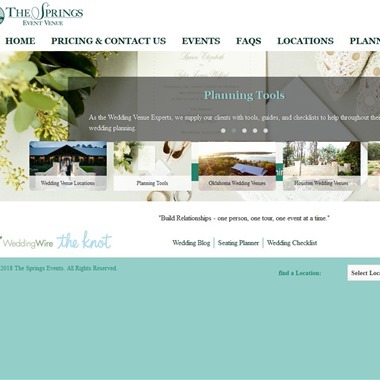 "The Pelazzio is one of the premier wedding venues in Houston, TX. 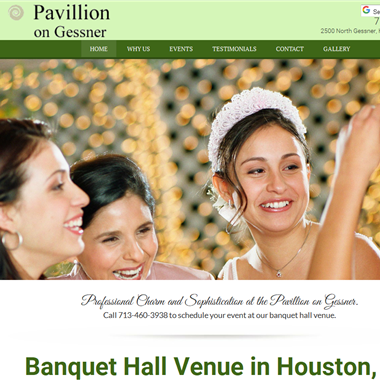 The Pelazzio is home to four of Houston’s most elegant wedding reception halls. 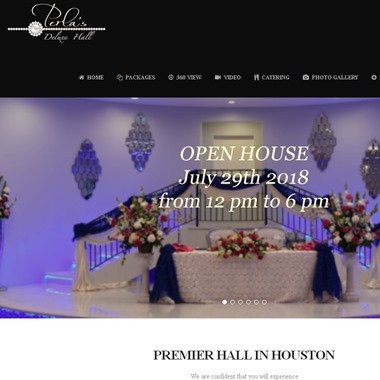 Yet even with the elegance that Pelazzio provides, it is also known as an inexpensive wedding venue in Houston." At Perlas DELUXE Hall Venue we take your special occasion very personal. 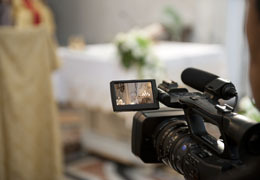 We understand the sensitivity and what it takes to get through the journey to make a special event a memorable reality. Will provide personalized one-on-one consulting just for you. We provide special packages to accommodate any kind of event and every budget. 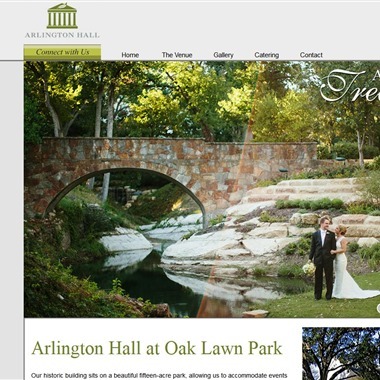 The wonderful Arlington Hall at Oak Lawn Park knows no limits. Do you want ten people? Do you want a thousand people? Arlington Hall knows no limits, with a wonderful open park with two Terraces, a stately Portico, and The Allman Pavilion. Arlington Hall will accommodate you and your budget. Reconnect with the nature! Perfection...down to the last detail. It is every bride's desire and every wedding couple's dream. At Fairmont Dallas, they are here to make your wedding vision a reality. As a landmark venue of distinction and tradition for over 40 years, they have been home to some of the finest weddings in Dallas. 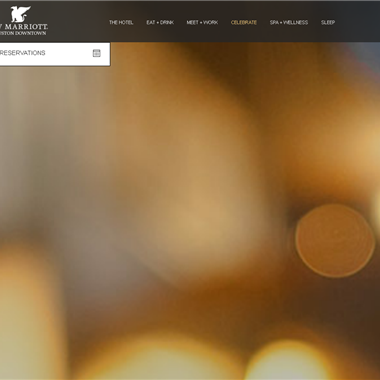 Slogan: Turning moments into memories for our guests.